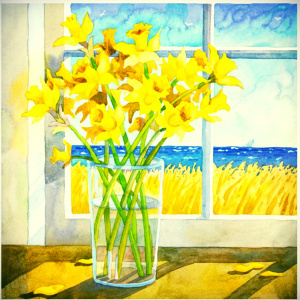 I saw the daffodils – gold against blue skies. Deep green stems, distorted in crystalline water, held my gaze. holding her hands, across the table. I didn’t see his eyes full of love, holding her gaze. I didn’t see her shine as he placed the ring upon her finger. I didn’t see the diamond sparkle or the gold glitter. I remained in place, remembering his words from the day before. I only saw the daffodils.